Tanzanian socialite and video vixen Amber Lulu (left), video vixen Haitham (right) and Haitham's husband. Just days after dumping her Kenyan boyfriend rapper CMB Prezzo, Tanzanian socialite and video vixen Amber Lulu has eloped with another woman's husband. For sometime now, there have been rumours of Amber being involved with the husband of Tanzanian video vixen Haitham. 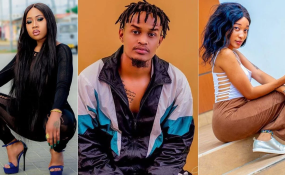 But just days after revealing that she had dumped Prezzo, Amber has now confirmed that she indeed been having an affair with Haitham's hunk husband. "Kwa nini mwanaume kamuacha yeye kaja kwangu. Hapo ndio pa kujiuliza. Haitham kwa sasa ananyonyesha, ni vyema akajituliza kuliko kurusha matusi mitandaoni. Haisaidii maana huyo mwanamume kurudi kwake ni ndoto," Amber said. The socialite dumped Prezzo six months after they reunited saying she couldn't keep up with him because she didn't understand him anymore. She even described him a 'layabout'.